Published in the 1930s to 1940s during the Golden Age of comic books, Marvel Mystery Comics was the first publication of Timely Comics, the company that would eventually become Marvel Comics. This guide to their values will help you if you have come across some old Marvel comics. If you're still not sure what they're worth, then don't worry. Let us take the load for you! Contact us for a free appraisal. We'll tell you what the books are worth, and make a cash offer if you wish to sell. 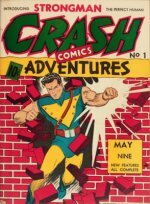 The first issue of the popular series, published in 1939 and simply titled Marvel Comics, featured the first appearances of Namor, the Sub-Mariner, the non-superpowered detective Angel, and the android Human Torch. The issue also included other Timely characters, including Ka-Zar the Great and the Masked Raider, and a two-page story about motor racing, titled Burning Rubber. 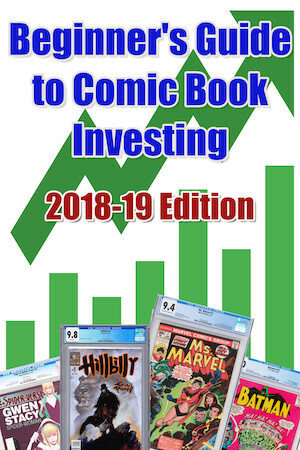 The comic book swiftly sold out its first run of 80,000 copies, and subsequently received a second printing of 800,000 copies which also sold out. This book is considered one of the most valuable comics ever printed. This comic book is worth a minimum of $20,000. The world record (CGC 9.0) was $161,000 in October 2005. It would raise more than that if it came back on the market again. 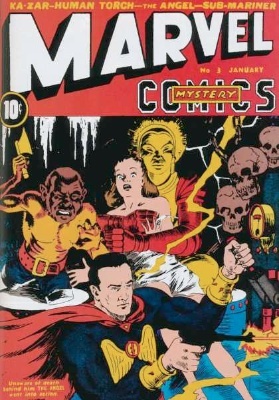 By the second issue, Marvel Comics was renamed to Marvel Mystery Comics. 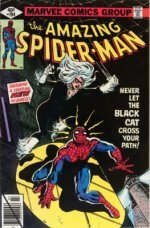 Featuring four stories, Marvel Mystery Comics #2 is another high profile addition to any comic book collection. In the first story, the android Human Torch is wrongly blamed and arrested for a series of fires at a motor raceway. He escapes and manages to finally clear his name and catch the culprit who is behind the fires. In the second story, the Angel confronts a member of an expedition team who is looking for lost treasure. In the next story, Namor the Sub-Mariner kidnaps a young woman in an attempt to start a crusade against Americans. In the final story of the issue, Ka-Zar confronts and eventually kills Bardak, an ape who attempts to take a mirror that Ka-Zar has in his possession. Comic book collectors will buy this book in any condition. It's worth at least $2,000. The record sale was $38,000 for a CGC 9.0. Marvel Mystery Comics #3 included four stories featuring the same four characters that were in the first two books. 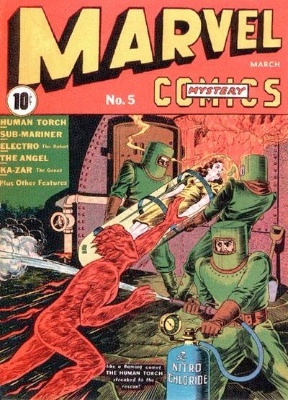 The Human Torch, in the first story, is attacked by a group of misunderstood aliens. Ultimately, he saves a woman and gives the aliens an advanced formula for improved TNT. The detective Angel witnesses a woman being kidnapped by members of a mysterious cult in the second story. He manages to save the woman and escape from the mansion where the cult was holding her. In the third story, Namor the Sub-Mariner is tricked by police when they use a female officer to capture him. Namor ends up nabbing the woman and saving an Allied ship that was attacked by a Nazi submarine. The woman convinces Namor that Americans aren't evil, after which he destroys three Nazi battleships using mines. He also disables a submarine, handing it over to the Americans. In the final story, Ka-Zar confronts an animal hunter, Steve Hardy, who catches a local elephant, Tuta. Despite believing that Hardy has good intentions, Ka-Zar rescues Tuta and the other animals that the hunter has trapped. Hardy eventually abandons his expedition when the locals who were under his control decide to leave. The record sale for this comic book is $25,000, but it's worth at least $1,000 in any condition (complete). Please feel free to contact us if you'd like to have your issue valued. 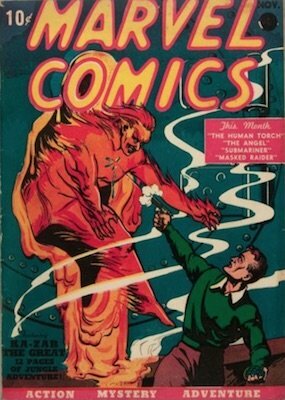 In the first story of Marvel Mystery Comics #4, the Human Torch takes on an army of "green flames", who in fact are being controlled by Dr. Menacye, who is threatening to destroy New York City if his ransom demands are not met. The Human Torch goes on to defeat Menacye easily. In the second story of the book, the detective Angel confronts Brute, a giant creature who works for a power-hungry mobster named Brinke. Brute eventually leads Angel to Brinke's hideout, where Angel ultimately kills Brute and defeats Brinke and his gang of thugs. In The Sub-Mariner Goes To War, Namor's story picks up from the last issue, where Namor defeated Nazi submarines and battleships. In this issue, Namor is convinced that though he should not take sides in the World War, he should at least prevent conflicts in which governments are forcing their people to fight. Namor saves an Allied cargo plane after it's been hit and helps take it to an Atlantean ship so that it can be transported to Norway. The Sub-Mariner ultimately finds out that an Allied ship is being held hostage by the Nazis. 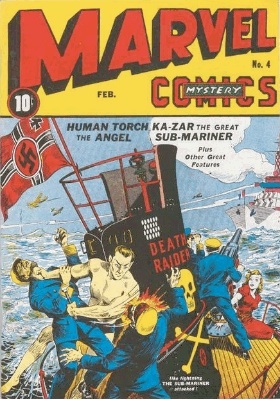 Namor ultimately rescues the crew aboard the ship, commandeers a German U-Boat, and uses it to sink other Nazi ships. He navigates the Allied crew members to safety. In the third story, the Masked Raider confronts and defeats a pair of thugs who accosted several gold pan handlers. The final story of this book features Electro, not to be confused with Spider-Man’s villain who will make an appearance in the upcoming Spider-Man movie. Marvel Mystery Comics #4 featured the first appearance of Electro, who was created by Professor Philo Zog, a brilliant professor who wants to help mankind. The professor hires dozens of field agents who simply investigate crimes and call in Electro if they think his service is needed. In this issue, Electro defeats a gang of criminals who have kidnapped child actor Joyce Lovely. The record for this comic book is $50,000, but it's worth $1,000 in any shape. Contact us if you'd like to have your comics valued. Click here to send us photos (front and backs cover photos are appreciated). 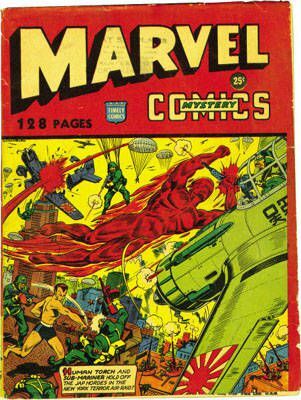 Marvel Mystery Comics #5, a great catch for the enthusiastic comic collector, features the Human Torch in his second ever cover, which is considered extremely classic and memorable. In fact, one of the owners of this rare find is Hollywood star Nicholas Cage. In the first story of this issue, the Human Torch decides to help a group of stranded citizens on Lake Superior. With a blizzard bearing down on the area, the Human Torch and an ally are prevented from rescuing the stranded citizens. They eventually commandeer a plane, though they crash land it near a band of crooks looking to take advantage of the situation. Ultimately, the Human Torch is able to defeat the crooks and save the day. In the second story, the secret detective Angel foils a bank robbery by overturning the bank thieves’ cars and foiling their getaway plans. In the third story, which is a continuation of the Namor story from last issue, the Sub-Mariner returns to the sea with his Atlantean army. He gains permission to return back to the surface to help humans. Upon his return, he is jailed by New York City police, but is released so that he can help save people from a subway flood. The minimum it's worth is $500, but the world record for this comic book is $33,000. Click here to have yours valued. 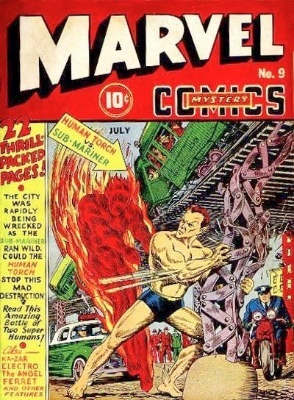 Marvel Mystery Comics #9 featured the first crossover story between two superheroes when the Human Torch and Namor, the Sub-Mariner, fight each other in an epic showdown. Namor, attempting to get revenge on New York City for locking him up, confronts the Human Torch, who is knocked out by the Atlantean warrior at the Statue of Liberty. Torch manages to escape before Namor takes him to Atlantis, and the two fight again at the city’s water reservoir. The ensuing fight injures Namor, who is unable to fly due to damage to his ankle wings. The two later fight at a chemical company where the battle comes to a stalemate. The fight is continued in Marvel Mystery Comics #10. In the second story, the Angel, traveling through Europe during the "night of the vampire", investigates the screams of a woman who is being kidnapped. Ultimately the Angel confronts and defeats a mad scientist who is trying to swap the mind of a human with that of an ape. In the third story, the Masked Raider confronts a group of gold thieves in Lawson City. And in the final story, Electro takes on Jago, leader of the Dragon-Men, who has captured Professor Zog and forced him to have Electro do his bidding. Eventually Electro and Zog overcome Jago and save Queen Nara of the planet Ligra. Click here to contact us about grading your book. 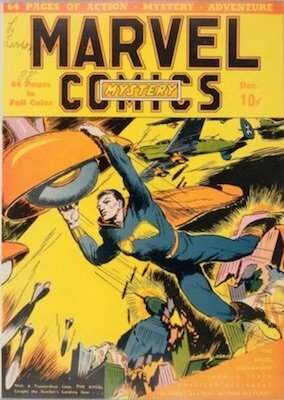 Published in 1943, Marvel Mystery Comics 128-page issue is considered one of the most valuable comic books ever due to its limited availability — only five known copies exist as it was only distributed in New York City — and its variation from the original version. Though the cover states that the book — a black-and-white reprint combination of Marvel Mystery Comics #41 and Captain America Comics #22 — has 128 pages, it in fact has 132 pages if one counts the blank inside covers and a blank back cover. This comic is so rare that very few have sold. A 6.5 graded comic sold for $26,000 recently. Find out what yours is worth if you have one. We've put in a lot of effort to value the world's rarest and most exclusive comic book finds. If you come across any of these, then contact us right away for a free appraisal. Find out the value of the Cap's first appearances, from 1941 to the end of the Golden Age in the mid-1950s. We value all the key issues and break down the finds. Silver Age coming soon! We break down all the most popular characters and series, showing you key issues, and helping you to value finds if you come across them. 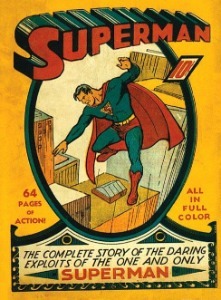 See values for Superman #1, Action Comics #7 and many more valuable issues. Need help with an inheritance or old collection?